Dumbarton Castle is located in the ancient capital of Scotland and is spectacularly sited on a volcanic rock overlooking the River Clyde. Conquer more than 500 steps to stand atop one of Scotland’s greatest strongholds. The iconic Rock of the Clyde has heritage as breathtaking as its views over the Clyde, Loch Lomond and Argyll. This dramatic volcanic plug, which is Dumbarton Rock, in-filled the crater of a volcano that was active 350 million years ago. The rock is well exposed and inaccessible on all sides. Click here if you want to learn more about this fascinating geological feature. Admire great examples of 18th century Georgian military architecture and stunning views from the Tower Crag. 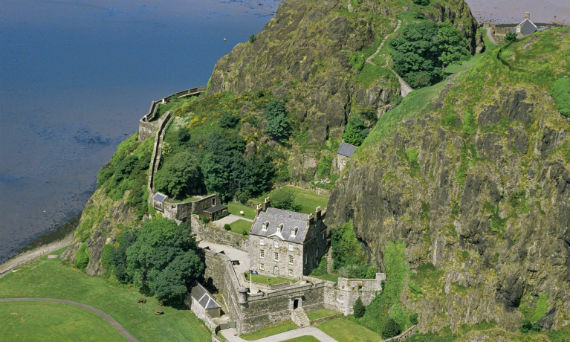 Throughout Dumbarton Castle’s long history it has been a royal residence and a fortress, and has many fascinating connections from the Vikings to the Scottish Wars of Independence. Mary Queen of Scots sailed to France from here as a child in 1548.